Posted By: PerseusSpartacus Date: 12/16/13 2:58 p.m.
: I know of no such thing. Would you perhaps care to enlighten me? Near the right side of the image is the room with the Shield Charger. You can see there is a second polygon behind it, marked 'Platform'. This is where the Invincibility Powerup is located. Now, looking to the left side of the map, you will notice a very bright blue polygon. 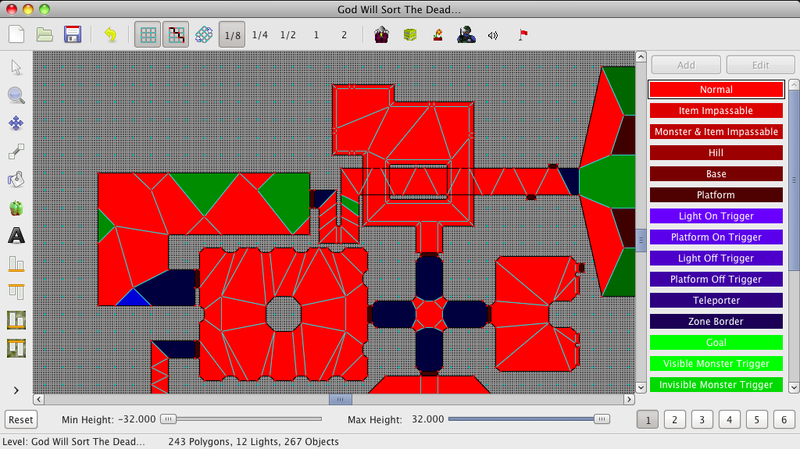 This is the polygon that activates the secret Platform. If you walk over the blue polygon (underneath an odd triangular pillar sticking down from the ceiling) and then run back to the Shield Charger, you can pick up the Invincibility Powerup. And no, the Spoiler Guide does not make any mention of this. And no, Hamish did not succeed this time in hiding information from me.